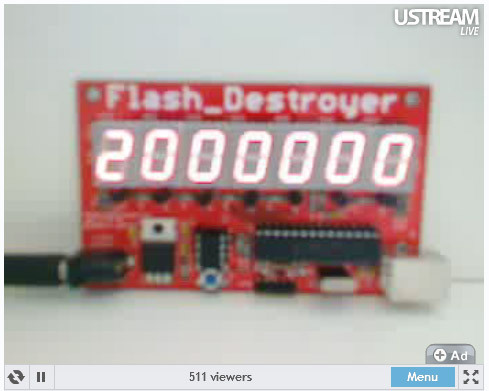 Some time in the last few hours the Flash Destroyer passed 2 million write-verify cycles. jnd points to Microchip application notes 01019A [PDF!] and 00537 [PDF!] that explain the EEPROM endurance characterization process. The higher the temperature, the worse the endurance will be. Generally, and approximately, a device which fails at 10 million cycles at 25°C will fail at 2 million cycles at 85°C and 1 million cycles at 125°C. The reasons for this are not conclusive (although there is much technical literature supporting one theory or another), but it is apparent that the failure mode of EEPROM cells (electron trapping in the tunnel dielectric causing shielding and dielectric breakdown) is strongly dependent on temperature. The EEPROM is specified for 1 million writes at the specified voltage and temperature extremes. Running at room temperature, this chip might surpass 10 million write cycles. Or not. Stay tuned and find out. Submit your final count guess to win free PCBs. This entry was posted on Friday, May 28th, 2010 at 9:04 am	and is filed under Flash Destroyer. You can follow any responses to this entry through the RSS 2.0 feed. You can skip to the end and leave a response. Pinging is currently not allowed.